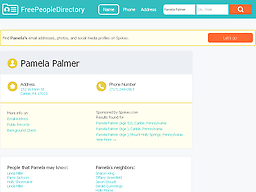 Free People Directory Who are you searching for? In some cases, a websites Terms of Service spells out ways to get your info off the site. This is sometimes referred to as a TOS removal. You can view Free People Directory’s TOS to see if it will help you get your info off Free People Directory. For instructions to opt out of Free People Directory visit .